The ‘Coast to Kosci’ (http://www.coast2kosci.com/) is one of the most challenging ultramarathons in Australia, and Jess Baker is the womens’ record holder. 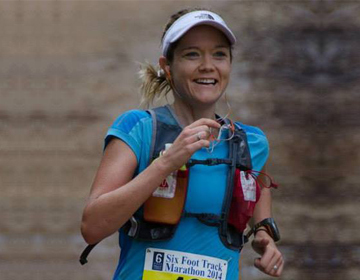 She tells us how she finds training with Sean Williams…. I have been training with Sean for about 8 months. I attend the running group morning sessions. Sean has created quite the training phenomenon in his sessions. Training as a group creates an experience much greater than a sum of its parts. Rain or shine, a huge turnout of a positive mix of ages and abilities means that each individual gets the workout that suits them and pushes them. The sessions alternate so you never get bored. It is incredible now to think how I tried to do “sprint” sessions by myself, down at the local oval??! The sessions are starting to dust the cobwebs off my few fast twitch fibres! You are the Coast to Kozzie female record holder. Tell us a bit more about that race. 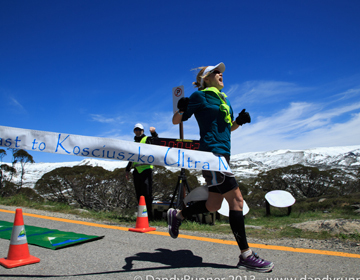 Coast to Kosci is a 240km race from the coast in Eden to Australia’s highest peak, Mt Kosciuszko. I ran it in 30hrs 4 minutes. 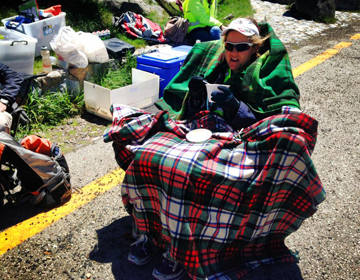 It was just one of those races where everything went well and I had the most sensational support crew. I wish the opportunity to chase down a record upon anyone. It was one of the most focused, raw, and exciting experiences of my life. I finished with absolutely nothing left to give. What was it like to be on the cover of R4YL????? Ha, awesome! I posted a copy to my mum! I wouldn’t be without the sessions. A new work place means that I attend less frequently now but I am committed to drive an extra hour to get in a workout that I couldn’t get any place else.